Piracy slowly grew from unorganized vigilante “coast guards” in the 1990s to transnational organized crime networks, wreaking havoc on the global shipping industry, in the early to mid-2000s. It reached its peak in 2011, when more than 28 vessels were hijacked in the waters off the Horn of Africa. Maritime crime has declined intensively over the past few years, as international naval patrols and armed guards on ships have increased. However, a recent report by Secure Fisheries, warns that those advances could be reversed if illegal fishing is not stopped. Today, illegal fishing, and specifically bottom trawling, by foreign fishermen destroys the Somali marine ecosystem, and often the equipment of local fishers. One of the fishermen in the Saylac area lost 40 percent of his fishing equipment due to foreign vessels, and further, was forced not to fish in the area. A loss of equipment can damage the ability for a fisher to continue his or her work, as new equipment will need to be purchased out of pocket. Furthermore, fishermen’s lives are threatened due to the fact that several Somali fishermen have been killed in their own waters by foreign fishing crews. For example, local reports indicate that on Sept. 29, 2015, a local fisherman was shot and killed in waters near Laasqoroy by Iranian illegal fishermen who were fighting with Puntland coast guards. Overtime, stories such as these have made the local people and fishermen very angry, and sometimes aggressive, pushing some into marine crimes like piracy. With all of this comes an increasingly smaller share of the catch, reducing the ability of Somalis to make a fair living through fishing. Foreign boats are hauling in three times more than Somali fishermen — an estimated 132,000 metric tons of fish each year compared to Somalia’s catch of 40,000 metric tons, based on multiple interviews and satellite evidence. 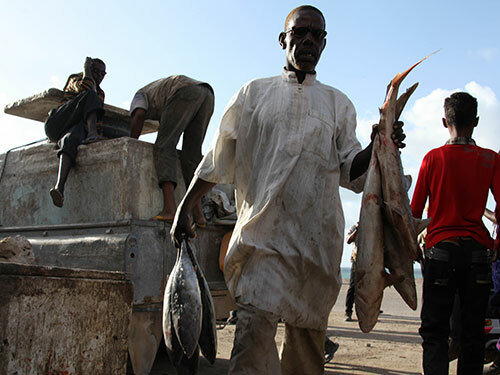 Foreign fishermen in Somali waters are only after certain valuable species, such as kingfish, jack fish, and tuna. These vessels often toss by-catch, non-targeted species, overboard. Additionally, for the last 20 years, foreign trawlers have been operating in Somali waters, very close to shore and in the same waters utilized by Somali fishers. This bottom trawling damages the ocean floor, kills coral, and produces large amount of by-catch, including sharks and sea turtles. This has led to a decline in a number of fish stocks. With its high economic and personal toll, illegal fishing continues to anger Somalis, especially in light of the recent EEZ declaration. This anger has been seized upon by pirates who use illegal fishing to justify and encourage piracy. The nascent coast guards along the waters of Somaliland are not yet enough in number and they don’t have the training, vessels and the equipment to effectively patrol their waters. Maritime forces for other Somali regions face the same challenges and lack of capacity to patrol and enforce their maritime space, which allows foreign fishers to fish with impunity. “Foreign fishing vessels are still seen as a threat to the livelihoods of Somali fishers,” the report said. “Somalis feel they cannot defend themselves against this threat.” Iran and Yemen have the largest presence in Somali waters, but boats from Europe and Asia also have “landed significant catches.” Two Iranian fishing boats were seized this year, in March and then in May, the first since May 2012. One effort towards a community-based solution, FairFishing, has been operating in Berbera, Somaliland since late 2011. FairFishing, an independent Somali-Danish NGO, advocates that the permanent solution to these inter-related problems can be reached by empowering Somali fishermen. Therefore, FairFishing works with local fishers to aid in the development of fishing skills, such as the use of fishing gear, the consolidation of the value chain and establishment of the necessary infrastructure on land. FairFishing in Somaliland is a small-scale example of developing organic solutions to illegal fishing and piracy on the ground, rather than with armed guards in the sea. This model and approach is simple, sustainable, and more cost-effective than investing billions of dollars in armed guards and patrols that do not consider the realities, such as widespread poverty, on the ground. If Somali fishermen are empowered, they will be able to aid in the protection of their waters through communication-sharing initiatives. Additionally, implementation of fisheries laws and management, and the development of sustainable livelihoods for Somali fishermen will help reduce the justification for piracy. As long as illegal fishing remains prevalent in Somali waters, piracy and maritime crimes will remain major dangers in the waters off the Horn of Africa. The international community has to address the basis of these problems by aiding Somalis in the creation of alternative livelihoods and a local fishery-based economy. Yusuf Abdilahi Gulled is the Country Director for Fair Fishing Somaliland, located in Berbera, Somaliland.